The PGA of America, in partnership with a Minneapolis based company named Wexford Golf, is launching a new concept in March of 2015: Large "golf experience" zones within a major airport that include golf simulators, club fitting, pro shop, plus dining and lounge options. And it's open to all airport travelers, but also to non-travelers. The first such retail/driving range area is called PGA MSP Airport; MSP Airport being the Minneapolis-St. Paul Airport, which serves 35 million travelers annually. According to the PGA, it will be the first "golf lifestyle facility" located in an American airport. What will visitors find? 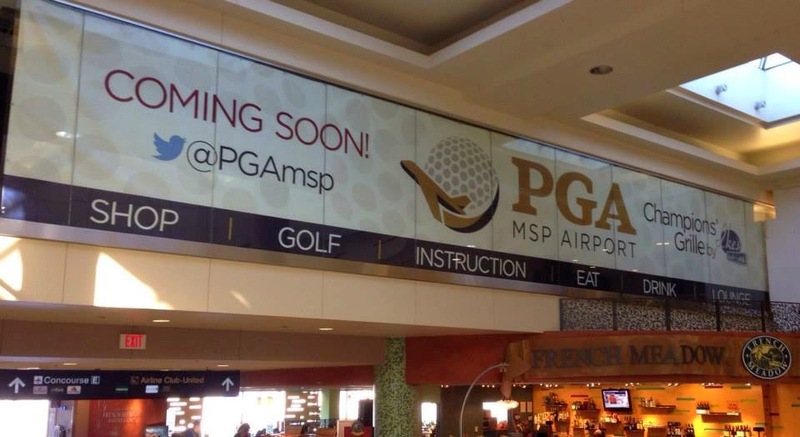 First, lots of space - PGA MSP will encompass 12,000 square feet of space inside the MSP Airport. Golf simulators: All ages and skill levels will be accommodated on leading golf simulators, which will allow golfers to play many of the world's top courses. Practice areas: A putting green and a virtual driving range. Help from PGA Professionals: PGA pros will be present to offer instruction or clubfitting. Pro shop: The newest equipment from all the top brands, and golfers will be able to test the clubs on the simulators. Food and beverage: A restaurant, a lounge, and other food and drink options throughout the facility. Visiting the pro shop or the Champion's Grille will be without an admission fee; there will be a $10 entry fee for the simulators and other golfing areas. Non-travelers will be able to purchase a day pass that gets them into the airport and into the PGA MSP area. Want to know more? Visit the website.